Prince Harry is to tour the US to promote the rehabilitation of injured American and UK troops, publicise his own charities and support British interests, St James's Palace says. His visit will take in several locations between 9 and 15 May. He will also watch the opening ceremony of the Warrior Games, in Colorado Springs, where injured servicemen and women will compete. A spokesman said he wanted to highlight "our injured servicemen and women". 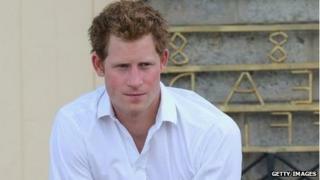 Prince Harry will visit Washington DC, Denver, New York, New Jersey and Connecticut. Britain is entering a team for the first time in the Warrior Games - a Paralympic-style competition - and the prince is known to be a supporter of the competition, after he met UK troops who took part as individuals last year. He will also meet survivors of Hurricane Sandy in New Jersey. And he will stage a fundraising Sentebale Polo Cup match in Connecticut, in aid of his African-based charity, which supports orphans and vulnerable children in Lesotho. Jamie Lowther-Pinkerton, the prince's private secretary, said: "Prince Harry wants to highlight once again the extraordinary commitment and sacrifice of our injured servicemen and women - our wounded warriors." He added: "Although a prince, Harry is also an operational soldier - indeed he's a soldier's soldier - therefore throughout this briefing the recurring theme is to help recognise and bring a spotlight on to the work being done to help these outstanding young men and women." The prince's visit to America comes seven months after a private trip to Las Vegas resulted in global headlines after he was photographed naked in a hotel room with a woman.